Long walk along the Grand River. 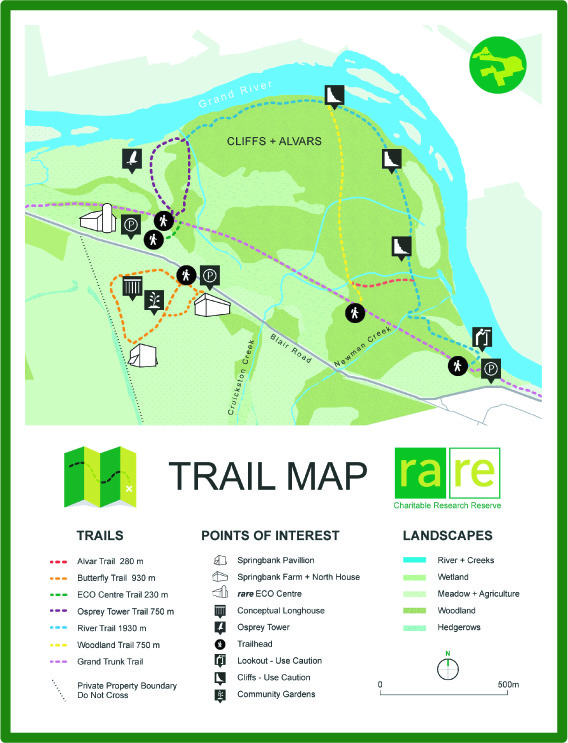 Perhaps the most recognized trail at rare is the River Trail in the Cliffs and Alvars. This rare trail, transects The Grand Trunk trail – which is part of a greater trail system maintained by The City of Cambridge. The River Trail runs adjacent to the Grand River along scenic cliffs and throughout second growth forests. It is closed to public access between November 15th and March 15th as it is a High Risk Zone for roosting Bald Eagles. When opened, The River Trail is accessed directly off the City of Cambridge Grand Trunk Trail at the George St. parking area or at rare’s 1840′s Slit Barn (768 Blair Road). When beginning at the Slit Barn, part of the rare ECO Centre, start at CAFKA’s “IMITATE” archway.